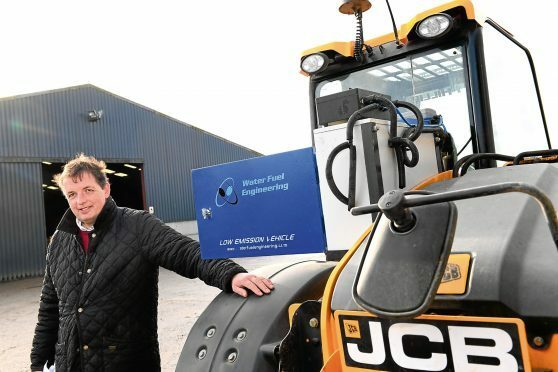 David Barron, who farms at Nether Aden near Mintlaw, Peterhead, is participating in a Scottish Government-funded trial into the use of hydrogen electrolyser technology on his JCB loader tractor. The loader has been retrofitted with a special hydrolyser, or hydrogen electrolyser as it is also known. This is not designed to replace the vehicle’s reliance on diesel, but instead reduce it and in the process cut its carbon emission output. The hybrid vehicle features a hydrolyser unit, which essentially puts an electric current through distilled water to create oxy-hydrogen which is then put through the engine. “You put distilled water in and it goes through the electrolyser, and gas goes round into the engine and it keeps it really clean,” said Mr Barron, who farms 570 acres in partnership with his wife, Nicola, and their three children, Jack, Tom and Jamie. He said as well as reducing the JCB’s carbon emissions, the hydrolyser unit had reduced the machine’s fuel reliance by about three litres per hour. Based on a fuel cost of 50p a litre, this equates to a saving of £1.50 an hour and a potential annual saving of £1,500 if the machine is used for 1,000 hours during the year. Phil Davies, of Water Fuel Engineering Ltd, which fitted the hydrolyser to the loader, said Mr Barron’s JCB was the first agricultural machine in the UK to be fitted with this new technology. He said: “What we have created is an electrolyser which produces oxy-hydrogen on board and on demand. He said the company was confident that the technology would be mass produced and commercially available to farmers, at an affordable price, from 2019. “We are really excited because in the past five to 10 years the government has made a lot of noise about emissions in cities, but in rural areas it’s more significant,” added Mr Davies. “What perhaps we will need to be thinking about is how heavy industrial traffic could actually contribute to cleaner air. Mr Barron’s interest in the hydrogen technology was sparked by his involvement in the Scottish Government’s Farming for a Better Climate initiative. His farm is one of nine across Scotland taking part in the project, which sets out to help farmers find ways to make their businesses more profitable and efficient, while in turn reducing their carbon footprint. Alan Bruce, of SAC Consulting’s office in Turriff, oversees Nether Aden’s involvement in the government project. He said improved efficiency and reduced carbon emissions went hand in hand. As well as installing the hydrolyser on his JCB, Mr Barron has discussed a wide range of issues with fellow farmers attending meetings at Nether Aden as part of the Farming for a Better Climate initiative. Topics covered ranged from grassland management to a “black v white” debate when deciding whether to continue using Charolais bulls or switch to Aberdeen-Angus on Nether Aden’s 130-cow suckler herd of mainly Angus cattle. Cropping was also discussed and Mr Barron has since taken the decision to reduce his winter cropping in a bid to cut fertiliser use – carbon audits of the farm revealed its fertiliser usage was too high. In addition, Mr Barron has enrolled Nether Aden in the government’s Agri-Environment and Climate Change Scheme and green manure has been incorporated into cropping plans as part of this. For Mr Barron, though, the real potential for future farm business improvement is the hydrolyser. He believes it is the first step towards a wave of new technology use in agriculture. He is confident in future years that technology which allows energy from renewable energy sources, such as wind turbines, to be stored as hydrogen could lead to farmers producing their own fuel and fertiliser. Hydrogen storage is currently possible, but the cost is too high, said Mr Barron. “The electrical charge through the water in the hydrolyser could be taken from renewables,” added Mr Barron.